What does Amitriptyline do for Fibromyalgia? Strawberry Cough delivers a fruity sweetness and a clear-headed high. This sativa-dominant strain of cannabis truly smells and tastes like strawberries. Its exact origin is well-disputed in the medical marijuana world. But, we do know that this strain was derived from some sort of Haze. Supposedly, according to marijuana folklore, it was first cultivated in a strawberry field. Some say that’s where it gets its unique fruity flavor. And, it packs a powerful punch with its 20% indica and 80% sativa makeup. The exact origin of Strawberry Cough is unknown, but it is definitely derived from the Haze strain. It’s said to have been cultivated in a strawberry field, which accounts for the sweet smell and taste. This strain also has slightly skunky undertones. Strawberry Cough, as the name suggests, has a sweet taste of fresh strawberries. Despite the light fruity taste, however, it has a skunky undertone which may explain the cough that it leaves its users with after smoking it. This strain delivers a unique aromatic experience that’s extremely pleasant. Prepare yourself for a cerebral high accompanied by the smell of fresh strawberries in a country field. The aroma lingers in the air, reminding you of an earthy tang and fresh fruit. You’ll also smell a hint of herbal notes, along with pleasurable sweetness. As soon as you inhale Strawberry Cough, your palate will get an explosion of the sweet, flavorful taste of berries. The aftertaste of its earthy yet spicy flavor will linger around inside your mouth for quite a while. If you like the taste of strawberries, this strain of cannabis will remind of the sweet, sugary fruit. For those seeking a mellow, slow acting strain of marijuana, Strawberry Cough might be the best choice. It typically isn’t too potent, although it does have the potential to be when smoked. It is said to offer a slow, easy descent into slightly euphoric, happy feelings. This is one reason why it’s so popular in the medical marijuana community. Many users report feeling relaxed and energized at the same time when they smoke Strawberry Cough. And, the biggest effect, a feeling of happiness, is notable in almost all smokers. In fact, for those who want to experience a light high that leaves undertones of joy, and an ability to function, this is one of the more popular types of weed to smoke. Strawberry Cough delivers an uplifting euphoria, but, it doesn’t cause you to become stuck. The high is pretty consistent, allowing you to get things done during the day. With just one toke, this strain will really make you cough. It may leave a tingling sensation in your throat after smoking this cannabis. However, once this disappears, the high is pure joy. Strawberry Cough is said to be an amazing benefit to those that tend to experience large amounts of stress and anxiety. For those who like a sweet, smooth tasting experience that leaves you feeling relaxed and calm, this is the preferred strain. All good things have some not so good things related to them. And, with Strawberry Cough, the negative side effects aren’t big enough to deter smokers from enjoying it. 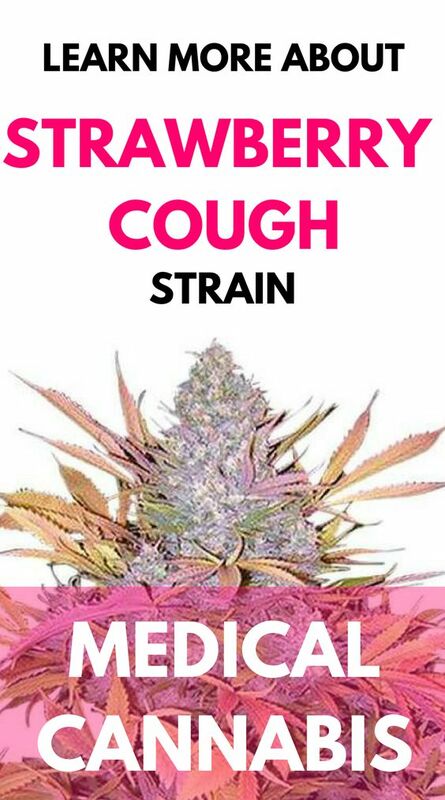 Remember, This strain of marijuana creates an unavoidable cough that even the most experienced smokers experience. Still, it is said that a resulting cough will taste like strawberries, and for many, it isn’t much of a deterrent. The most commonly reported reaction is a dry mouth, also known as cotton mouth. Many say this is quickly remedied by consuming extra liquids while smoking and afterward. Dry eyes are another negative side effect, but this side effect is also short lasting and not severe. Eye drops may help if needed. In rare cases, Strawberry Cough may cause feelings of anxiety and paranoia. Some also experience dizziness, but these effects are not especially common. Strawberry Cough contains 0.20% CBD, making it a very effective strain for medicinal purposes. Since it has such a calming effect, this strain is often used to treat feelings of stress and social anxiety. Many who struggle with high levels of stress experience relief when they add this strain of marijuana to their anti-anxiety regimen. Some medical marijuana patients have given up their anti-anxiety and anti-depressant meds and treat their conditions with cannabis only thanks to this strain. Strawberry Cough can also be used to help address feelings of depression. This is because it creates feelings of happiness and euphoria in users. Also, since it tends to be a lighter type of high, this strain allows smokers to function throughout the day without feeling groggy, lethargic or bogged down. CBD tinctures are some of the more popular and easy to use forms of Medical Cannabis. CBD tinctures have been used for thousands of years in a variety of forms. Some people who do no like to smoke flower, vape, get “high”, or experience many of the side effects found when smoking THC products often prefer Oil Tinctures. It is usually sold in small, to medium bottles with droppers for the user to consume it sub-orally (drop under the tongue). CBD is absorbed quickly into the blood stream tinctures are a fast acting option for many people. A tincture is a liquid medication, made from extracting certain chemicals from an herb by using alcohol. Is Raw Cannabis a Superfood? Thanks for sharing superb informations. Your web site is so cool. I’m impressed by the details that you¦ve on this site. It reveals how nicely you perceive this subject. Bookmarked this website page, will come back for more articles. You, my friend, ROCK! I found simply the info I already searched everywhere and just couldn’t come across. What an ideal web-site.